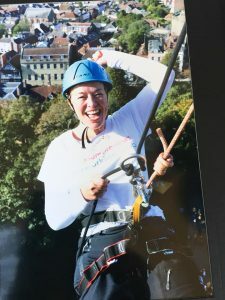 Home » Why did we jump off Arundel Castle for Chestnut Tree House Charity? Why? Why would you want to jump off an 180ft Castle Turret?! That was the most asked question when we told people about doing the Charity Abseil. 1. Small actions – BIG effect. We knew that our small actions combined with everyone else’s small actions would make a BIG difference. The event had 400 signed up and everyone had to raise a minimum £300 which equates to a whopping £120,000. We raised a total of £750. Anyone can raise £300 if they put their best creative mind to it! 2 Great role model for our kids! Our families came to watch and cheer us on! they knew we were nervous, and about as far out of the ordinary routine Saturdays as you can get. And they saw us prepare, teeth chattering and do it anyway – albeit with knees a-knocking! When you’ve made a commitment to a worthy cause, chickening out is not an option! you have to feel the fear and do it anyway. As parents we spend lots of time supporting and cheering on our children. We spend countless hours at sports days, football matches, harvest Festivals and Christmas concerts to name but a few. Now, they had a chance to experience what it’s like being the support crew. 3. Inspire our MNC members. If we are seen to be taking action and completing something out of the ordinary, maybe they will feel inspired to do something outside of their own comfort zone. Which we all know is where the magic happens and we love a challenge! It is very refreshing to focus on projects outside of your work life. And dare we say family life! It is like chicken soup for your soul. Never underestimate the positive effect such a thing can have if you are going through difficult times. The training and planning can be good for your physical and mental health. The sense of achievement stays with you once you have completed your challenge. 5. Team work and belonging. When you sign up to an event you automatically became part of a team, both on the day and online. You are naturally drawn into a community of supporters , a family of helpers, and an army of volunteers. Make no mistake your actions have a ripple effect which go beyond the day of the event. These include the money raised, the people you inspired and the lives your contribution has touched. 6. Learn about new charities. And support the work they do. You play a part in raising awareness and your action can help influence others into getting involved. These events are great way to create a shared experience and bond with family and friends. You can train together and spend time together, get fitter and stronger along the way. Most importantly you can laugh, cry and celebrate together! And the memories can last a lifetime. Do your ‘Thing’, now more than ever you have more options to raise money for charity. 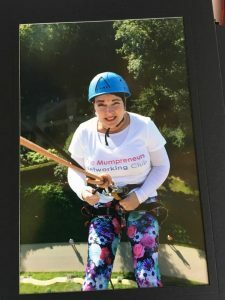 With continually reduced funding from central government and local authorities, charities have to be more creative than ever in order to continue to survive. Your choice of challenging fun educational fundraising events is vast! There will be something that will challenge you, tickles your fancy and by taking part you can make a contribution to a cause aligned with your values. We’d love to hear about your efforts and your plans. What will you do next ? The money raised through events is a crucial part of charities providing services to customers. It is not until you have to use those services that you really understand the importance of every penny raised. Get involved it’s great fun, we promise ! Nicky and Sara have already got their next Charity event planned. It is a total corker and their most scary yet!